Eric Ebron has found a new home. ESPN’s Adam Schefter reports (via Twitter) that the tight end has signed with the Colts. It will be a two-year deal worth a maximum of $15MM. Ebron’s blocking skills leave a bit to be desired, but the tight end has been plenty productive in the passing game throughout his career. He finished the 2017 season with 53 catches for 574 yards and four touchdowns. The former first-rounder ultimately rated as an above-average tight end, as Pro Football Focus ranked him 13th among 71 candidates at the position. 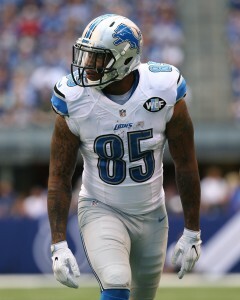 Assuming Andrew Luck is healthy, Ebron would provide the quarterback with another talented target. The free agent would presumably displace Jack Doyle from the starting lineup in Indy, although there could be enough targets for the duo. Doyle had his best NFL season in 2017, hauling in 80 receptions for 690 yards and four scores. The Colts will have to ultimately make some decisions at tight end. The team is now rostering seven players at the position, including Darrell Daniels, Ross Travis, and Erik Swoope. After being released by the Lions, there was plenty of interest in the 24-year-old. Besides the Colts, the Patriots, Panthers, and Ravens were all connected to Ebron. K we have 60 million in space still after this. There’s no need to release Doyle or anything crazy. We have enough targets to go around and it will allow us another distraction for the running game provided we bring in a running back. Andrew is going to like this guy. Doyle will still start. Ebron may as well. Our base offense has 1 RB, 2 WR’s, & 2 TE’s. Ebron; however, needs to learn to block. So talented, and so frustrating. As a Doyle fan I’m surprised Indy made this move, but hopefully they can both still get some run.